A reserved but strong Sandy Koufax made his presence felt in five of the greatest seasons in baseball a pitcher could amass. The overpowering left-hander from Brooklyn, NY dominated the National League from 1962-66, capturing three Cy Young Awards, the ERA title in each of those seasons and MVP in 1963. His blazing fastball, combined with an incredible overhand curveball, made him one of the most feared hurlers ever. Koufax threw no-hitters in each season from 1962-65, capping it with a 1-0 perfect game on September 9, 1965 against the Chicago Cubs at Dodger Stadium. That game was considered one of baseball’s all-time best as opposing pitcher Bob Hendley surrendered only one hit to the Dodgers. Although an arthritic pitching elbow and rare circulatory problems in his left index finger eventually halted his career prematurely, Koufax was forced to pitch in pain while achieving brilliant feats. He was the league’s strikeout leader four times, was tops in wins with 27, 26 and 25 and racked up 40 shutouts in his 12-year Dodger career. 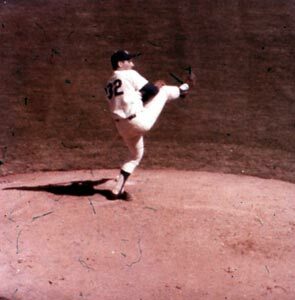 He won 165 games, struck out 2,396 (including 382 K’s in 1965) and had a miniscule 0.95 ERA in four World Series. 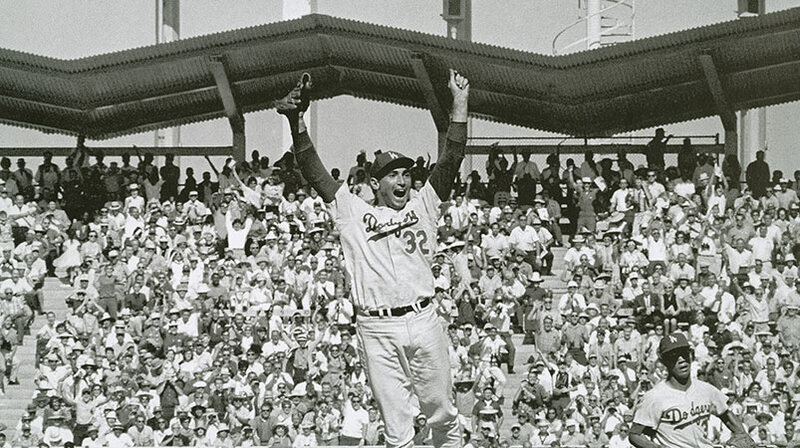 He was the World Series MVP in 1963 and 1965, leading the Dodgers to titles in both seasons. 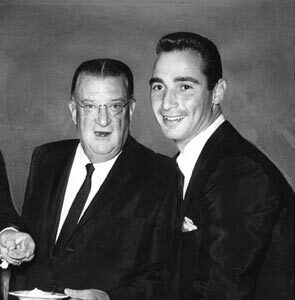 While Koufax and teammate Don Drysdale held out in tandem for a larger contract prior to the 1966 season, Walter O’Malley and Vice President and General Manager E.J. “Buzzie” Bavasi eventually worked out a solution, despite O’Malley’s reluctance to move into the six figure salary range. However, Koufax was paid $125,000 and Drysdale $110,000 for the 1966 season. At the same time, O’Malley understood the importance of not bashing the product, his two star pitchers in this case, even though they hired J. William Hayes, a prominent entertainment lawyer to represent them in negotiations. It wasn’t always easy for Koufax, who struggled to find his control early in his career in Brooklyn, beginning as a bonus baby signee (he had to stay on the major league roster for two seasons) on December 15, 1954. He first joined the big league club in 1955 replacing fellow southpaw Tommy Lasorda on the roster. Amazingly, Koufax was only 36-40 after his first six major league campaigns. Koufax played first base at Lafayette High School and was captain of the school’s basketball team in his senior year. He pitched as a freshman at the University of Cincinnati drawing widespread attention when he struck out 34 batters in two consecutive games and went 4-0 with 58 strikeouts in 30 innings pitched. Dodger scout Al Campanis signed Koufax. A deeply devoted man, Koufax opted to observe the holiest Jewish holiday, Yom Kippur, instead of starting the first game of the 1965 World Series game. His move was fully endorsed by the Dodgers. In his book, “Alston and the Dodgers,” the Dodger skipper writes “Even before the Series began, I was being questioned about the effect, if any, on the team, if Sandy insisted on not pitching, but I considered this was strictly his business and this was understood by all the Dodger family. You have to give Mr. O’Malley credit, too. The big boss asserted himself promptly when the question was put to him. ‘I wouldn’t let Sandy pitch on his Day of Atonement if he wanted to,’ Mr. O’Malley said, and that ended that.” Drysdale started in his place. 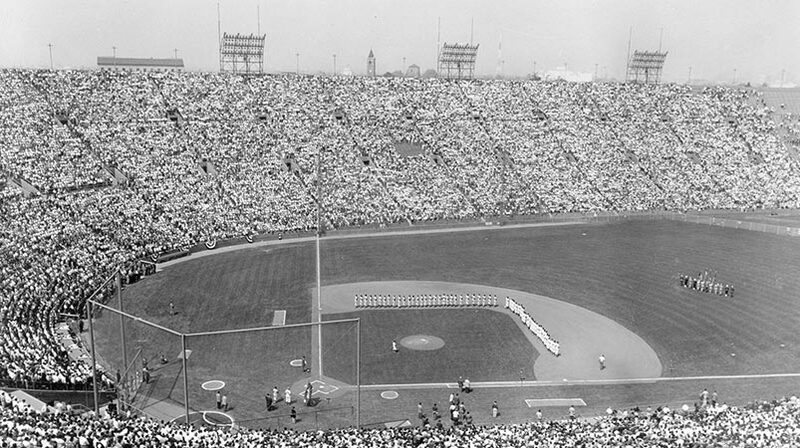 Koufax was praised by religious leaders for putting his beliefs first and baseball second. Koufax was the last pitcher on the mound for the Brooklyn Dodgers, as he made a relief appearance in the eighth inning in Philadelphia, allowing two walks and one strikeout to close out the historic chapter in team history in 1957. He also was on the mound in the final baseball game played at the Los Angeles Memorial Coliseum on September 20, 1961, as the Dodgers defeated the Chicago Cubs, 3-2, in 13 innings behind Ron Fairly’s base hit. Koufax pitched a complete game, struck out 15 and made 205 pitches, as he picked up his 18th win of the season. He was born the son of Jack and Evelyn Braun, but his parents were divorced when he was three years old. His mother married Irving Koufax when Sandy was nine.